An American Opera Signed DVD & Poster! 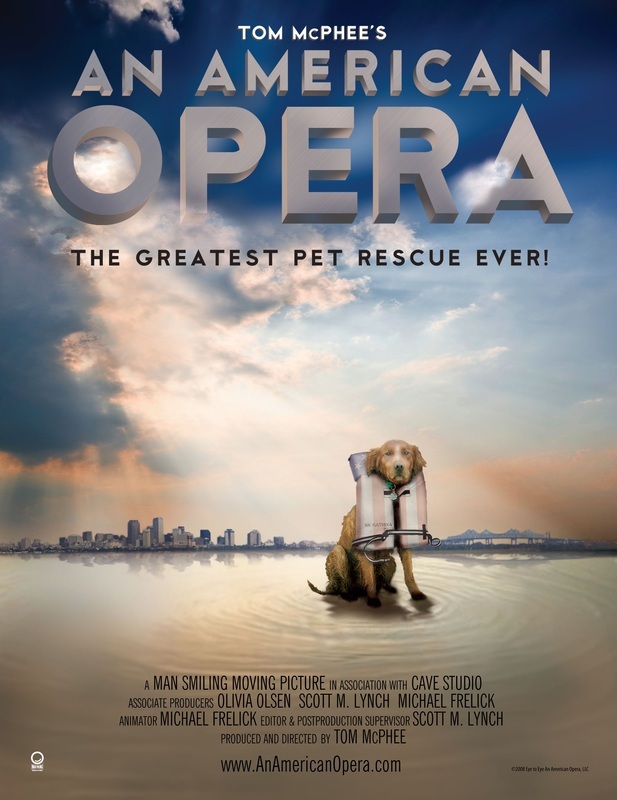 AN AMERICAN OPERA (AAO) is a visceral, operatic vision of what happened to the people of New Orleans who were forced to evacuate without their beloved pets and the volunteers who came from all over the world to help. AAO has won 6 awards playing at more than 30 Film Festivals and is still playing to TV audiences around the world. 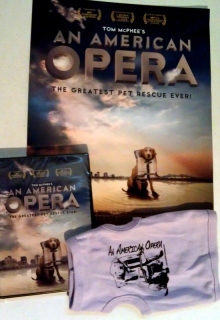 AAO showed for some there was no hope for people & paws alike. That was the most emotional roller coaster I have been on. It was beautifully illustrated, the musical selections fitting, the stories were gut-wrenching. It is truth. I was disgusted by the lack of coordination, yet proud of the many rescue volunteers and the lengths they went to continue to rescue these helpless & sometimes trapped animals. Tom McPhee unearthed facts I had not known, and exposed them for us... and I became infuriated. I can only hope karma will catch up to them sometime soon. McPhee covered all sides fairly, giving all a chance to state & justify their strategies .... I absolutely LOVED it. Yet, I remain sickened by the truth it exposes as well. As I believe we have not learned, politics and power will still rule the day for those in higher places than the average rescuer. I believe as Martin Luther King believed and once said, "Our lives begin to end the day we become silent about the things that matter". Mr. McPhee has not, and will not remain silent. He teaches us without bias. We need only listen. He simply presents truth, and allows us make our own determinations. Remain silent, or learn. McPhee created a beautiful documentation of history that many are not aware, but need to be. Every animal lover needs to know this story. And be prepared. Be ready to speak up, to act, to learn, and not repeat mistakes. To Mr. Tom McPhee I simply say THANK you for creating this and sharing it with the world. I only hope EVERYONE will see this, and know the truth. Because they need to know the truth. And react. Then act. We cannot afford to make the same mistakes. We cannot call ourselves a humane nation and continue down the same path. In conclusion I simply state: 2 thumbs & 4 paws up!! ~ Kristy S.
The World Animal Awareness Society is an award-winning tax exempt 501(c)(3) non-profit public charity as determined by the IRS, incorporated in the State of Michigan. Contributions to the the Society are tax deductible under section 170 of the Code. EIN: 27-1918794. The World Animal Awareness Society is also qualified to receive tax deductible bequests, devises, transfers or gifts under section 2055, 2106 or 2522 of the Code. You may also donate with a check or M/O: send to: World Animal Awareness Society, 13909 Arbor Hill Cv. Manor, TX 78653.